Continuing the theme of unusual mueslis (unueslis?) this weekend's main attraction is this cranberry and pecan muesli. As with all my other samples the idea was to find the cereals without any raisins or sultanas as I dislike them and the way they overpower otherwise lovely food. Unfortunately I didn't spot that this has 5% raisins in it, which is why it's sat in the cupboard for longer than usual. I decided to give it a try anyway, reasoning that it wouldn't be too difficult to pick out a few black raisins and leave the red cranberries behind so after adding 4 or 5 raisins to Ms. NLi10s bowl of the Dorset Fantastically Fruity I'd made for her it seemed safe. There is an almost cinnamon taste to the praline crunch parts of the cereal which is quite nice but for a luxury cereal it's quite low on flavour and it lacks texture as all of the flakes are quite small and flat. When I did find a stray raisin the initial flavour was actually improved, but then the aftertaste kicked in and I remembered why I dislike them. Their ability to overpower is probably what led to the few creeping into the box. As a mid price cereal (cheaper than the Dorset & Lizi cereals) it needed the flavour boost to make it seem more luxury to match the box and brand aspirations. I finished the box of the chocolate curl muesli from the same range before getting around to the review (I'll have to buy more - such a shame...) and that surpasses this in every way. 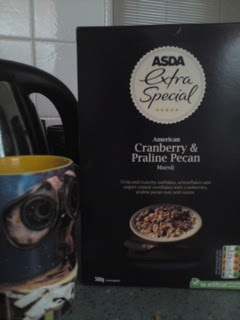 If you are prepared to leave the raisins in and want an everyday muesli that you can still eat while in a hurry then I guess this is a decent option, but the mix just isn't for me. I'll probably finish the box, and may grow to like the subtle American flavours, but I don't think I'll be picking it up again as there are many other options which I prefer. Ones that aren't bulked out with raisins.